In this blog post, we will highlight the effects of using the color BLUE. As you can see above, blue is the color that is related to being trustworthy and responsible. It is a color of honesty, loyalty, and reliability. It is considered to be the “safest” color to use because it builds a feeling of dependability to customers that they will associate with your brand. Blue is a color that is related more to personal communication, rather than mass communication, which makes it a more personable and connectable color. Blue is a calming color that slows down heart rate and reduces appetite. It is a therapeutic color for both the mind and the body. It is the perfect color to use if you want your company to be associated with trust and reliability. It is also a suiting color for any companies related to the sky, air, or to water. There are very few downsides to this color. The negative connotations to the color are unfriendliness, or being considered too predictable or conservative. Additionally, due to its connection to reducing appetite, it is not a smart color choice for any companies or products relating to food. Lighter shades of blue are ideal for companies or products relating to relaxation, health, wellness, or travel. Darker shades of blue are ideal for those companies that want to emphasize a sense of honesty and integrity, as the darker shades are considered to be more serious. Blue in general is typically a universally liked color and a safe choice. 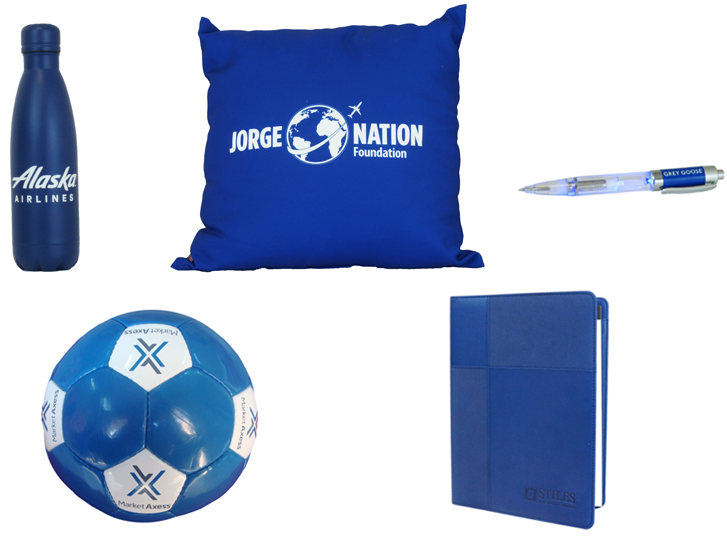 Here are some examples of previously made promotional products using the color blue to give you a taste of what MRL can create for your company.